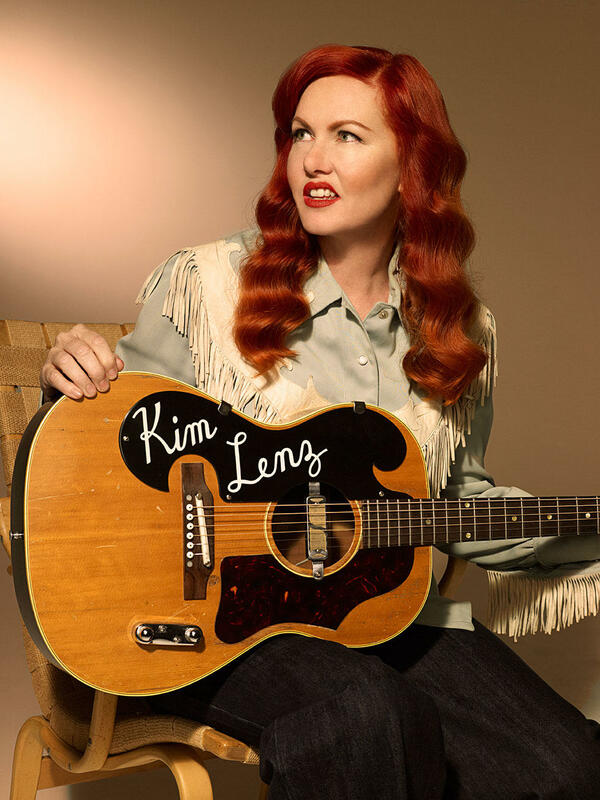 The queen of traditional rockabilly music, Kim Lenz is a dynamic performer whose rootsy, swaggering sound evokes the twangy heritage of classic performers of the 1950s like Wanda Jackson and Janis Martin. Rising out of the Dallas rockabilly scene of the 1990s, Lenz quickly established herself as an Americana star. Backed by her band the Jaguars she issued two break-out albums on the Hightone label -- 1998's Kim Lenz & the Jaguars and 1999's The One and Only -- playing classic songs and originals. While she remains indebted to the vintage rockabily stars of the '50s, she has expanded her sound; albums like 2013's Follow Me and 2019's Slowly Speeding have showcased her love of old-school R&B, Western swing, and country. With a mother who rode in rodeo and a father who was a fan of Wolfman Jack, Lenz learned about good music early on during her youth in Southern California. Born in 1966 in San Diego, she grew up listening to the recordings of such artists as Janis Martin, Wanda Jackson, Faron Young, and Johnny Horton. During her childhood she played the piano, and started playing the guitar during her teen years. For a time when she lived in Los Angeles, her workplace's radio only picked up the music of the big-band era, which led her to become acquainted with many of the old standards. At one time, Lenz majored in psychology while she attended the University of North Texas. Before she earned her degree, she hooked up with a few musicians who wanted to form a band. Lenz joined in, and the half-a-dozen singers and musicians called themselves Rocket, Rocket. Before a year had passed, however, the group disbanded. In the mid-'90s, she settled in Dallas, where she pulled together a band of her own, the Jaguars, originally featuring Tom Umberger on lead guitar, Shawn Supra on bass fiddle, and Scotty Tecce on drums. In 1996, Lenz and the Jaguars put out an EP on the Colorado-based Wormtone label. She began to draw local attention, and the following year the Dallas Observer named her the Best Female Vocalist. Hightone's Larry Sloven heard the EP and was so taken by Lenz's sound that he offered her a recording contract with Hightone's subsidiary HMG. The label issued the band's debut album, Kim Lenz & the Jaguars, in 1998. Of the recording's 14 tracks, Lenz penned more than half. Also featured on the album were covers of "Ten Cats Down" (originally recorded by the Miller Sisters) and "The Swing" (recorded previously by Johnny Carroll). Produced by Wally Hersom, the bassist for Big Sandy & His Fly-Rite Boys, the album was largely recorded on vintage recording equipment. The following year, Lenz issued the equally vintage-sounding The One & Only. A compilation album, Up to My Old Tricks Again, arrived in 2005. In 2009, Lenz returned with the studio album It's All True. After the album's release, she found out that she had been adopted; the news came as a shock and subsequently, she entered a period of deep self-reflection. Also around this time, Lenz suffered another blow with the death of longtime friend and bandmate, guitarist Nick Curran, from cancer. It was out of this period of turmoil, however, that Lenz developed the music for her next album, 2013's Follow Me. Featuring production from journeyman roots-music pianist Carl Sonny Leyland, Follow Me showcased Lenz' newfound strength and swaggering rockabilly attitude. Slowly Speeding, which arrived in 2019, found Lenz expanding her roots-rockabilly approach with forays into old school R&B, Western swing, and country music.